Triple-A games are marketed more aggressively than ever these days, with dozens of trailers emerging in less a trickle than a flood in the build-up to release. Middle-earth: Shadow of War looks to be no different, so we thought it’d be useful to pull together all the trailers and preview footage into one dedicated hub. This way, if you miss any, you’ll only need to check one place. Welcome to said hub. Want details, as well as footage? Here’s everything we know about Middle-earth: Shadow of War so far. We’ll update this whenever Warner Bros. release a new trailer. Expect that to happen quite a lot as we near release, which is scheduled for August 22 this year. You’ll find the most recent trailer at the top, with a short description of what it reveals. Without spoiling much, we get our first hints at the story beats in this trailer which dropped just ahead of E3. Talion and Celebrimbor seem to be tilting further towards megalomania, there’s some pontificating on the corrupting nature of the rings, and a sinister new woman character is introduced. We see a little more of the world this time, with some environments that, compared to the drab grey of the first one, look almost pretty. Also, more dragons and troll-mounted siege weaponry. A deeper look at the Nemesis system, once again courtesy of IGN. And another look at the Nemesis System, this time via an orc named Bruce. A closer look at Shadow of War’s weapons and gear, including the new weapon challenges and gem sockets. Here, the devs take a closer look at Shadow of War’s skill tree, courtesy of IGN. 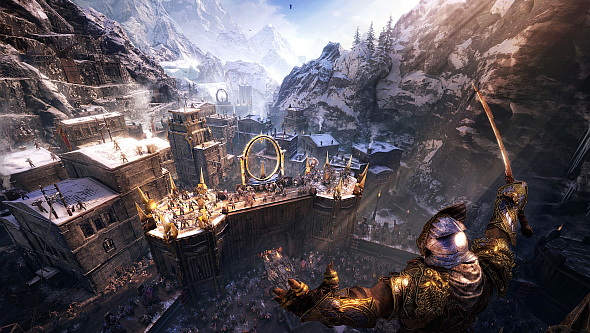 The first of many IGN First videos shows Minas Ithil under siege. One of the earliest Shadow of War videos was a 16-minute look at improvements made to the system that made its predecessor famous: the Nemesis system. Where it began: the official reveal trailer dropped at the end of February.